When backpacking through certain parts of the world you will have to get used to a particular cultural aspect of shopping very quickly. Haggling. Knowing how and when to haggle is not only an integral part of the backpacking experience, it can save you a lot of money too! The ancient and noble art of haggling (also known as Not Getting Ripped Off – Fu) is a skill that you will have to master when you are backpacking on a budget, as not only will it stop you getting taken for a ride, but it will also save you a considerable amount of money, let you stick to that budget you planned before you set off, and get you some great deals in the bargain. What’s more, in many parts of the world, it is even expected! I know it is completely opposite to many cultures here in the West, but it is simply the way things are done in other parts of the world. The vendor will think it’s his lucky day if you don’t even try! Either that or they’ll think you’re a tour group sheep straight off the tour bus and jack the prices up ten times what they were originally going to quote you. Either way it’s not good for you. A lot of people – especially if they are a little shy or do not have a lot of self confidence – find it extremely hard to haggle. I can understand this to an extent, you may think it is rude, you don’t want to cause offence or upset anyone. 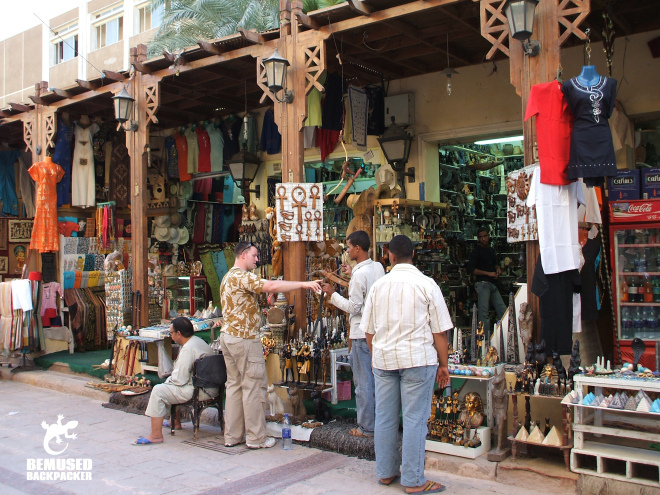 You may not even feel that you have the right to haggle, well don’t worry about it. As I’ve already said in many places they actively expect you to haggle, it is the normal part of the buying process. Then you also have to remember that there is the dreaded ‘tourist tax’ (also used to be known as the white man’s tax in less politically correct times), where anytime an obvious tourist or backpacker tries to use a taxi, get a hotel room or buy something off a local or tourist market, all of a sudden the normal price gets jacked up four or five times the going rate. Do you really want to pay all that unnecessarily just because you felt too shy or cheeky to ask for a discount? Honestly, you are not being rude by not accepting the first price. Some of the best haggling sessions in markets or back street shops come off as a really bad performance from the local amateur dramatic society! You may even be invited into the shop for a sit down and a drink as the negotiations begin and the vendor quotes you a massively inflated price. In return you quote a more realistic price and the vendor acts shocked and offended that you could dare offer such a low sum of money. The entire idea is of course an affront to the very core of his being. You act equally as wounded, deploring the serious transgression of such an obviously marked up price. Obviously you don’t even want the item in question anyway, it is only of passing interest to you. The vendor then implores your sense of fair play, reminding you that he has two wives, twenty three kids and a really annoyed mother in law to keep happy, you reply with the fact that you are simple backpacker and are obviously very poor. At some point in the game you will both arrive at a price you are happy with, shake hands and make the deal. There are obviously a few things to remember during any bartering session. The first is that although there is no fixed price, there is a reasonable buffer zone of what can be expected by both you and the vendor. There is no reason to barter excessively to the last pound, baht, rupee or peso just because you can, as long as you are happy with the price you are paying then it is a good deal. Saying that, you should be aiming for roughly between a third and half of the original quote. Use your common sense to tell you how much an item is worth, if the vendor starts insanely high (which they will sometimes) then you start insanely low. If it is a little high, then you go a little low. Remember the dealer will not sell an item to you at all unless he makes money on it, so no matter how much to the contrary they tell you, they will be making a profit on the sale. One of the most important things to remember is to keep your cool and keep calm. Just be polite and be respectful, these people are just trying to make a living, yes, even the ones who are trying it on. I know it is frustrating sometimes when every single person quotes you twenty times what the going rate is, but it is all part of the game. Haggling is fun, treat it as such. Finally don’t even start haggling unless you are serious about buying the item. If you can’t agree on a price and walk away that is different, but don’t insult people by wasting their time. Bartering for hotel or guesthouse accommodation follows the same basic rules but is slightly different in delivery. Whatever the quoted rate is, always begin by asking ‘is that your best rate?’ In many cases this will result in an immediate discount. If the person behind the desk is reticent, then simply remind them that the dozen other places on the exact same street will be glad of your custom and walk away. You will be surprised how often you are stopped after just a few steps. They want to fill rooms just as much as you want a bed for the night. Again of course, if the new quoted price seems reasonable to you for the room you are getting, then it is a fair price, don’t snub a great deal for the sake of a few pennies. The walking away trick works for almost every other bargaining opportunity too, if the other person is initially unwilling to come down in price, walk away. I’ve literally had people chase me down the street shouting come back! Taxi and tuk tuk drivers and other forms of short distance transport are a different matter altogether. 95% of the time you should insist they use their meter. If you are genuinely in a place that has no meters (or are using a tuk tuk), then be aware of the rough fare you should be paying for the distance and demand that. Of course reasonable common sense comes into play here, if the driver is asking a slight fraction more than what it should be, then it doesn’t really matter. If he is adding an extra zero or two to the final fare he is taking the proverbial and you should demand the correct fare or get another taxi. Where you can and can’t haggle. Generally the more developed the country, the less open to bargaining it is. Europe, Australia, North America for example are not likely to have a huge haggling culture. More developing nations or regions such as South East Asia, India, the Middle East or Africa more often than not, do. In certain situations at least. That isn’t to say that you can’t bargain for a good deal in Europe or there aren’t countries that don’t have a haggling culture in Asia, because there are always exceptions to the rule. You just have to learn where it is and isn’t acceptable. Saying that however even within those countries where it is expected, you can generally only get away with it in certain places. High end malls and the majority of food places tend to have fixed prices, and will not haggle. Walking into a 7/11 and declaring to the bemused shopkeeper that you will give him half price for the water and crisps you just grabbed off the shelf will probably just get you chucked out. But haggling will be expected at that tourist market where the quoted price of a fake designer handbag or tailored suit is 4 or 5 times more expensive than the genuine article on Bond street in London. In that situation you can feel free to haggle till your little hearts content. So there you go little grasshoppers, you have learned all you can from your Master in the ancient art of Not Getting Ripped Off Fu, you are now black belted masters of the highest order in haggling. So go out there, practice your skills and enjoy it! Haggle Hard, But Don’t Be A Cheapskate! How To Haggle Successfully On Your Gap Year. How To Manage Your Money On Your Gap Year.